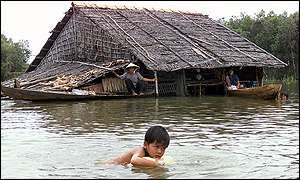 August 19, 2008 - Rising Mekong floods upstream may cause landslides and deep spread in Cambodia and southern Vietnam but the seasonal floodwater would also bring farmers good crops of rice and fish, officials said on Tuesday. Cambodia has alerted villagers of rising waters and the authorities have prepared 4,000 boats and life-jackets for the vulnerable areas in the eastern provinces of Kampong Cham and Kratie, the national disaster management committee said. The Mekong River Commission said the river from northern Thailand to central Cambodia was higher than it was in 2000, when the worst floods in four decades struck southern Vietnam. The winter-spring crop, the Delta's top yielding, produced 10 million tonnes of paddy in April with a yield of 6.2 tonnes per hectare, prompting the government to raise Vietnam's annual rice exports by 13 percent from earlier targets.